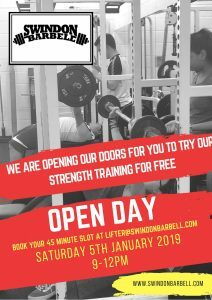 On Saturday 5th January Swindon Barbell is opening it’s doors for an open day, giving you the chance to come and see what Powerlifting is all about! Better yet, it’s free! You can try as much or as little as you like, and we are open to meeting people of all ages and abilities so don’t worry if you have never lifted a single weight before, we would be happy to meet you and introduce you to the sport that we all love. If you would like to bring a lifter who is under 18 please let us know when you email us so that we can be sure to accommodate them. Lifters on the day can test their Squat, Bench or Deadlift form and receive pointers from our coaches to help them improve in their regular training, and if you decide you like training with us we can talk about membership options with you too!